This is an opportunity to own a classic cruiser at a great price! The Island Trader 41 is a classic William Garden design. She sports a clipper bow, wineglass transom, full keel and heavy displacement. She is a seakindly design, split rig, with plenty of storage making her a great choice for extended cruising.If you are looking for a classic, long range, cruiser call to come see her today. At this price somebody is going to get a great deal! United Yacht Sales New Jersey would love to guide you through a personal showing of this 41' Marine Trader Island Trader 41 1979. This yacht for sale is located in Merritt Island, Florida and priced at $32,900. For a showing please contact us by filling out the form on this page and we will get back to you shortly! 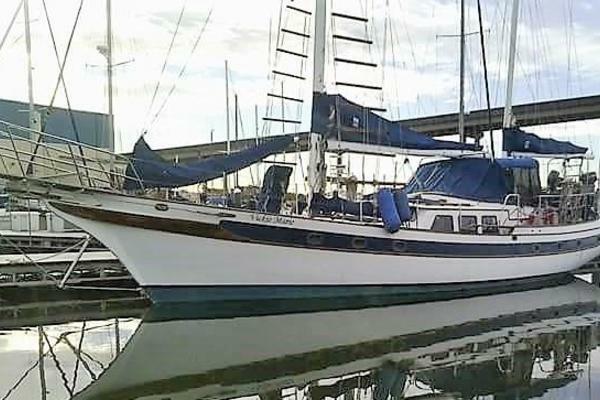 This Island Trader 41 center cockpit ketch is a William Garden design with comfortable accommodations. She has a spacious cockpit, large salon with full galley, and two private staterooms. Whether you are planning a weekend getaway, a cruise to the islands, or are looking to live aboard, this 41 is ready to accommodate. On deck, we have a large center cockpit. She has a teak interior with walk through galley design. There’s an aluminum mast and Spars. Sails are in great shape and include Main, 105% Genoa, Mizzen, mizzen staysail. Below there is room for an extended cruise with two private cabins. The salon features a L-shaped settee to port with built-in bench to starboard. There is a full galley aft to starboard with spacious cabinets, custom counters, and deep, double stainless steel sink. Under counter appliances include refrigerator and gimbal mount stove. There are two private staterooms. The forward guest stateroom has V-berth with under-berth storage, drawer storage, and hanging locker. The guest head compartment has head and vanity. The master aft cabin has full berth, ample storage, hanging lockers. The aft head has vanity with molded sink, and full shower with 6’4” headroom. Auxiliary power is provided by the a 50-hp Perkins diesel engine. Continual maintenance and a complete rebuild in 2012 make her perform like new. You have to see her to appreciate her, so call now for more information and to schedule a showing of this timeless Island Trader 41 center cockpit ketch.